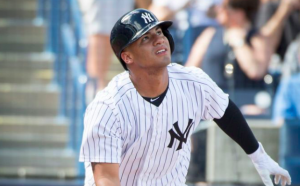 The New York Yankees will be without rookie sensation Gleyber Torres for the foreseeable future. The Yankees placed Torres on the 10-DL with a hip strain following Wednesday’s win over the Braves. The club is hopeful his stay on the DL will be brief. However, the Yankees are likely to keep Torres on the DL at least through the all-star break, which is less than two weeks away. The Yankees aren’t sure how Torres hurt his hip. He first felt tightness in his right hip flexor during Monday’s game. He was not included in the starting lineup Tuesday, although he did enter late in the game. Torres was back in the starting lineup for Wednesday’s matinee. However, his hip tightened up during his second at-bat Wednesday. An MRI then revealed a strained right hip. The injury is the first setback in what has been a sensational rookie season for the 21-year old Torres. To this point in the season, he’s hitting .294 with 15 home runs and 10 doubles, posting an OPS of .905. Blocked at shortstop by Didi Gregorius, Torres has become New York’s everyday second baseman. He’s quickly become an important part of the team’s lineup. Boone indicated that Torres could have played through this kind of injury if it popped up late in the season. However, with time on their side, the Yankees won’t take any chances, even as they find themselves in a tight race with the Red Sox atop the AL East. With Torres likely out for the next couple of weeks, Brandon Drury and Neil Walker are both candidates to fill-in at second base. Drury has had a rough season and only recently returned from a stint in the minors. But he’s a capable second baseman and could start to hit with regular playing time. Walker is a more natural second baseman. However, he’s also struggled to get going this season, hitting just .188 with an OPS of .527. Considering how many quality hitters the Yankees have in the rest of their lineup, they should be able to survive a couple weeks without Torres. Right now, the club believes that the issue is a minor one that should clear up soon. In the long run, the Yankees will need Torres in their lineup to be at their best. However, they will undoubtedly miss Torres in the short term.